We’d love your help. Let us know what’s wrong with this preview of The Last Time I Saw You by Liv Constantine. To ask other readers questions about The Last Time I Saw You, please sign up. Okay.......so let's sort this one out. The Last Time I Saw You opens with a dying woman. She's face down on a marble floor. Gotta be some money involved here. We feel the life slowly seeping out of her. The circumstances around this tragic scene have yet to be revealed. The light fades and so does our victim. Enter Dr. Kate English, a pediatric cardiothoracic surgeon, who sits in complete shock upon hearing about the death of her mother, Lily Michaels. She and Lily were so close. Her father, Dr. H Okay.......so let's sort this one out. Enter Dr. Kate English, a pediatric cardiothoracic surgeon, who sits in complete shock upon hearing about the death of her mother, Lily Michaels. She and Lily were so close. Her father, Dr. Harrison Michaels, is lost without his wife's presence and returns to his practice after the funeral. Lily was his world. Kate, on the other hand, is unable to set her own life back in motion as the mother of young Annabelle and the wife of architect, Simon. She's taken time off from her shared practice with her father and has become more reclusive at home. Something just doesn't seem right in regard to her mother's death. If this was a burglary gone wrong, nothing was taken. The only evidence is a broken window. To add to her worries, Simon and Kate had been separated for a while and he's only recently moved back in. It appears that Simon has a roving eye. Simon also can't stop the financial bleeding in his architect business. Simon Says: Can ya lend me a dime? The stage revolves and an ol' friend from the past shows up for Lily's funeral. Blaire Barrington and Kate were inseparable as teenagers. They had a falling out when Blaire spoke up and told Kate that she shouldn't be marrying Simon. He wasn't good enough for her. Decked out in bridesmaid dress attire, Blaire leaves the wedding party and the two have never spoken since. But Lily's death forms a point of reunion and forgiveness for both women. Blaire decides to stay at Kate's for a few days to provide comfort to her and to sift through events leading up to Lily's death. Now here's where Liv Constantine (actually two sister writers under one name) ladle on the creepy sauce. Kate begins to receive threatening texts containing eerie nursery rhymes. Dead mice and birds find their way into the master bedroom. And it appears that someone is watching Kate's every move. The more that things start going down hill, the more Valium rolls out. The Last Time I Saw You is a munchy little mystery. But, at times, it's a check-off-the-necessary-ingredients type of read. We've got a slew of suspects and a slew of daily weird events packed tight on every page. You'll see it coming, but the coming will just have a change of costume this time. The wrap-up is thick with explanations to make sure that no loose ends dangle. It's a lot to sift through. As I always say, take this one out for a test drive for yourselves. It's received quite the reviews. It's perfect for a weekend read as it does entertain. Please…don’t shoot the messenger! Waaaaaaah! I loved the Constantine’s THE LAST MRS. PARRISH and couldn’t wait to read their newest offering. THE LAST MRS. PARRISH is campy, delicious fun with two ultra-devious women trying to out maneuver each other for the affections of Mr. Parrish. First 1/3: Slow, yet confusing- why so many characters? Second 1/3 : Repetitive, boring. Kate, our main character, is repeatedly “haunted” by scary texts from her mother’s killer. It quickly begins to feel like a bad tv episode of Pretty Little Liars. Last 1/3: Ridiculous!!! Every soap opera cliché is pulled out of the box, truly laughable stuff. Despite my complaints, it still felt like a two-star read for me. I like the setting of the super wealthy characters, always entertaining to see how those socialites live! Plus, I did finish the book. But, if you are a true lover of psyche suspense, you will want to skip this one. Kate English is coping with the death of her mother who was recently murdered in her home. Lily’s death was a shock to her quiet Baltimore community because she was so highly regarded. A few days after her death, Kate begins to receive horrible threats against her family. Security and surveillance are brought into her home but these threats proceed to unsettle her life. During the funeral, her childhood friend Blaire comes from New York City to comfort Kate, and their relationship is reignited. Kate English is coping with the death of her mother who was recently murdered in her home. Lily’s death was a shock to her quiet Baltimore community because she was so highly regarded. A few days after her death, Kate begins to receive horrible threats against her family. Security and surveillance are brought into her home but these threats proceed to unsettle her life. During the funeral, her childhood friend Blaire comes from New York City to comfort Kate, and their relationship is reignited. Blaire spent many summers living with Kate's family when she was younger. She is a writer with a flexible schedule and decides to stay with Kate to help her through the ordeal. With her research background, she also decides to delve into Lily’s death by investigating the murder on her own. This is the second book by the writing team named Liv Constantine. I loved this novel as much as ”The Last Mrs. Parrish” due to its clever twists, suspense and well crafted ”creepiness”. I often ask myself how two of the loveliest people can create these sinister stories. I was super excited to read this mystery/thriller after reading the synopsis, but sadly it was just an okay read for me. The beginning and the set-up of the premise was intriguing and the pace was was working until it didn't. I was hoping for more character development with more interesting characters. The protagonist became annoying with too much over the top reactions to the ongoing situations. There really was too much repetitiveness and too many suspects to really add to the overall conclusio I was super excited to read this mystery/thriller after reading the synopsis, but sadly it was just an okay read for me. There really was too much repetitiveness and too many suspects to really add to the overall conclusion of who-dunit. When the suspect was revealed it was just lack-luster. I'd say it was readable enough if you're looking for a middle of the road kind of mystery.I don't know? I could be wrong, but I like a more clever puzzle in my mysteries. I do plan to read The Last Mrs. Parrish (which I own) and have heard is a twisty one. Holly B Shelby wrote: "Wonderful review, Holly! I loved The Last Mrs Parrish, but found The Last Time I Saw You to be a letdown in comparison. I think you’ll Shelby wrote: "Wonderful review, Holly! I loved The Last Mrs Parrish, but found The Last Time I Saw You to be a letdown in comparison. I think you’ll much prefer Constantine’s first release 💕"
Well, I didn't have quite the same good reading experience with this one as I did with The Last Mrs. Parrish. I think I would have enjoyed this one more as a novella rather than full- length book because the longer the story dragged on, the less I cared if something bad happened to the main character. Dr. Kate English is devastated when she finds out her mother Lily was brutally murdered. Even though Kate has been estranged from her childhood friend Blaire for years, she still reaches out to her for comfort and the two are quickly able to pick up their friendship. While the police are investigating the murder, Kate starts getting creepy text messages. It is soon apparent someone is out to destroy Kate's life and there is quite the list of suspects who might want her dead. The story goes back and forth between the perspectives of Kate and Blaire. So the authors (Liv Constantine is a pen name) do set the stage for what should be an intriguing mystery. Unfortunately, I figured out a little too early into the story which direction it was going to go and was really disappointed when I turned out to be correct. I like being fooled rather than being right. Now, I will say I did not guess correctly the entire plot but enough of it that it did feel like a letdown when I finished the book. Kate just became increasingly more and more annoying as the story progressed to the point I was actually rooting more against her than being on her side. I get that she was under stress but still lady, you got to treat people a little better. This book just wasn't on the same level as the authors' previous novel. At times the writing veered into bad cheesy soap opera territory. At the core, there are many good elements of the story but I think it needed a little more tlc before going to publication. With that being said, I look forward to reading any future books the authors write as I do think they have talent even if this particular book wasn't a winner for me. FULL REVIEW WILL BE ON MAY 6. A dead body, a threatening text, dead animals with a child’s nursery rhyme attached, more threatening texts and packages, the return of a long-lost friend, and a confused, frightened family await the reader in THE LAST TIME I SAW YOU. Who could have murdered lovable, charitable Lily? Why did Lily want to change her will a few days before she was murdered? This book will be enjoyed by women's fiction fans as well as mystery fans so put your thinking caps on and hone up FULL REVIEW WILL BE ON MAY 6. This book will be enjoyed by women's fiction fans as well as mystery fans so put your thinking caps on and hone up on your detective skills. I would like to thank Edelwiess for a an ebook copy of this book to review. After reading the Last Mrs. Parrish I really hide high hopes for this book. It was not what I had hoped for. It was an okay read but didn't have the twist and the buildup that Mrs. Parrish did. So going into this I guess my expectations were too high. I felt like around the middle of the book it was dragging and it was more of a whodunnit, than a book that had you on the edge of your seat. After the murder of her mother, Dr. Kate English reunites with Blaire, her estranged longtime friend. Blaire, a successful mystery writer, soon puts her own skills to use with the hopes in solving this horrific crime. Blaire had never been a fan of Kate's husband Simon and when she learns of her friend's separation, he becomes the main suspect. This one is for anyone who enjoyed Liv Constantine's earlier thriller, The Last Mrs. Parish. It seems like The Last Mrs. Parrish was a favorite for many last year, so much so I decided to give the writing duo Liv Constantine a go. The Last Time I Saw You opens with the murder of Lily, a high society philanthropist. No one can understand why she was murdered, especially her daughter Kate English. Before the funeral, Kate reaches out to her estranged best friend Blair for support, she comes running. After the funeral Kate keeps getting anonymous text messages telling her she will be n It seems like The Last Mrs. Parrish was a favorite for many last year, so much so I decided to give the writing duo Liv Constantine a go. The Last Time I Saw You opens with the murder of Lily, a high society philanthropist. No one can understand why she was murdered, especially her daughter Kate English. Before the funeral, Kate reaches out to her estranged best friend Blair for support, she comes running. After the funeral Kate keeps getting anonymous text messages telling her she will be next. Racked with grief and fear Kate asks her best friend Blair to stay and help with the investigation. It is clear someone is out for Kate and no one is able to figure out why. Can Kate trust anyone? I read this book in a very short space of time because it was very fast-paced. There is a lot going on between the murder of Kate's mom, the taunting messages, and Blair coming back in the picture. Liv Constantine is able to grab your interest and keep you engaged. While I was engaged throughout the read I cannot say I was impressed or "wowed". I figured out the ending half way through and I cannot say I care a lot about the characters, none moved me. Also, I am not a fan of characters being made to look unreliable. If you are looking for a fast paced read, this might be it. I cannot say I was impressed with the overall book, it was a bit too generic for my taste. I loved The Last Mrs. Parrish and I was practically jumping up and down with excitement when I found out that Liv Constantine wrote another book. This book is about murder, mental health, friendship, secrets, marriage, money, memory, and mother-daughter relationships. It's well paced - not fast, not slow - and this pacing kept me engaged throughout the book. Kate is an unreliable narrator just like Nellie/Vanessa in The Wife Between Us, and she gets worse as the story progresses. I wasn't sure if I loved The Last Mrs. Parrish and I was practically jumping up and down with excitement when I found out that Liv Constantine wrote another book. Kate is an unreliable narrator just like Nellie/Vanessa in The Wife Between Us, and she gets worse as the story progresses. I wasn't sure if she was imagining things or if she was the person wreaking all of the havoc. I would have liked more of a backstory on her, but this book had plenty of character development and I enjoyed the ride. Liv Constantine's last book drew me in right away and when I got comfortable with its direction, bombs were dropped and the plot turned unexpectedly. This time, I was on guard for bombs as I read this book. I was not disappointed; I loved the surprises, twists, and turns. I’ve been waiting for book #2 to come out after The Last Mrs Parrish as it was a fave of mine. This one was great until about 3/4 in and then I’m not sure what to say about it. So I’m giving it 3 stars. I was left a little disappointed since I loved The Last Mrs Parrish so much more. Holly B Recently finished this one and a bit disappointed as well! One of the best perks about being an author is that I get copies of books before they come out!!! Love these two twisted sisters and their next thriller - coming out in May. Pre-order and do not miss! Liv Constantine delivers the goods with this cat and mouse thrill ride! As characters unravel and new suspects are revealed, Constantine keeps us guessing until the final, shocking twist. Masterful plotting, skillful character development, and a story that pulls at the he One of the best perks about being an author is that I get copies of books before they come out!!! Liv Constantine delivers the goods with this cat and mouse thrill ride! As characters unravel and new suspects are revealed, Constantine keeps us guessing until the final, shocking twist. Masterful plotting, skillful character development, and a story that pulls at the heartstrings – The Last Time I Saw You has it all. The Last Time I Saw You is the latest thriller from sisters, Lynne and Valerie Constantine, who go under the pen name of Liv Constantine. I loved their first book, The Last Mrs. Parrish, and was thrilled to hear about this one! Kate English is coping with the death of her mother who was recently murdered. During this time, Kate reconnects with her estranged longtime friend, Blair, a successful mystery writer, who decides to put her skills to the test to figure out who murdered Kate’s mother. Ove The Last Time I Saw You is the latest thriller from sisters, Lynne and Valerie Constantine, who go under the pen name of Liv Constantine. I loved their first book, The Last Mrs. Parrish, and was thrilled to hear about this one! Kate English is coping with the death of her mother who was recently murdered. During this time, Kate reconnects with her estranged longtime friend, Blair, a successful mystery writer, who decides to put her skills to the test to figure out who murdered Kate’s mother. Overall, I thought the book was a decent read. The characters were well developed and well written. The beginning felt a bit too slow for me and I was getting impatient reading about the backstory. The last 100 pages is where all the action took place. It didn’t keep me at the edge of my seat like The Last Mrs. Parrish and a couple of the twist were a bit predictable. However, there some things I didn’t see coming and I really liked the way the ending was. All in all, I have to say that I do prefer The Last Mrs. Parrish over this one, but The Last Time I Saw You is definitely worth checking out. Disclaimer: I received a free advanced copy of this book from Harper Collins in exchange for my honest opinion. This has no effect on my opinion, review, or rating. Only three weeks until release!! Get to pre-ordering folks! “The Last Time I Saw You” was a disappointing read for me, in stark contrast to the first book, written by the ladies behind this pseudonym. Their first book, “The Last Mrs. Parrish” is a favorite thriller of mine, which is high praise, because I do not often pick favorites. “TLTISW” follows the immediate grief that our main character, Kate, is sucked into, after her mother’s murder. Kate is also receiving suspicious packages, like dead animals and strange objects in packages with threatening notes. Kate begins to feel paranoid and worried that she and her family will be hurt or killed. We also have a second perspective, from her bizarre, old friend, Blaire, who seems to still hold a grudge over Kate’s dismissal of their friendship. However, Blaire is helping with Kate and her family’s grief and trying to forgive Kate. To be honest, I had very high expectations, considering the authors and my previous reading experience from them. I was not very interested in the premise initially, thinking that this was a pretty basic, run-of-the-mill psychological thriller. Unfortunately, every typical trope that I do not enjoy in thrillers popped up, also allowing a very predictable ending. There are two main twists, one that was not surprising. The other was not predictable, but it was not very shocking or compelling. For those who like unreliable narrators, suspicious main characters, gaslighting, and calm resolutions, this might be for you. However, I like big dramatic climaxes that feel satisfying and justify the entire read. I do have to mention that I love the prose, dialogue, and detail. I feel that the authors still crafted a well-written story, by writing style standards. I love the detail that the authors put into every scene. Everything is very visual and allows for a very clear mental image of the story. I remember enjoying those aspects in “The Last Mrs. Parrish”. If you hope for a book that you can “see in your head” like a movie, this is very cinematic. Sadly, I was still very unhappy and not satisfied with this book. I feel that I was let down in comparison to their first book, so I still highly recommend that one. I’m sure that some readers will enjoy this, but I prefer to stick with “The Last Mrs. Parrish” and hope for a movie or miniseries. The Constantine sisters have done it again! Another outstanding psychological thriller from the dynamic duo. The Last Time I Saw you is fast-paced with a whole lot of unexpected twists. Nothing is as it first seems. I highly recommend this to all fans of this genre. Many thanks to Edelweiss, Harper and Liv Constantine for my complimentary e-copy ARC in exchange for an honest review. All opinions are my own. The first page wholly gripped my attention; We are greeted with a heart-thudding scene, giving us the impression that something horrible is going to happen sometime later in the book. One of the things that intrigued me most is how each character seems to have a motive for killing our victim, Lily. Which makes it even more challenging to know who to trust as new people from Kate's past seem to suddenly come back into her life. We are given Kate and her best friend Blaire's POVs, and through scenes The first page wholly gripped my attention; We are greeted with a heart-thudding scene, giving us the impression that something horrible is going to happen sometime later in the book. We are given Kate and her best friend Blaire's POVs, and through scenes filled with unease and suspense, we begin to understand that someone is brutally toying with Kate English, and they're seemingly not going to rest until she's destroyed. And slowly, it starts to sound as if the culprit might even somehow have access to her own home. Things are misplaced, threatening poems and messages are sent, and the things that the perpetrator is doing to mess with Kate get crazier and CRAZIER with every chapter. In the middle of the book, we see how it's difficult for Kate to trust whether she's paranoid or truly living this sinister ordeal as she's surrounded by these people whom she's known most of her life: her husband, her father and her best friend...Someone is clearly conspiring against her, and they're possibly closer to home than she thinks. Or are they? Is the villain who's currently messing with Kate the same person as her mother's killer? I've never come across writing that is as tempting as Liv Constantine's - one that succeeds to keep you engrossed and invested in the story - one that discusses paranoia, mental health, motherhood and the complexities of friendship. I found myself enjoying the character Blaire, who plays the role of the best friend. She doesn't trust Kate's husband, or anyone else for that matter, and her investigation techniques are so deliciously gripping. I loved the twist ending. The A-ha! moment when you finally realize who it was all along. The aftermath was action-packed and original. Sadly, this follow up to THE LAST MRS PARRISH lacks all of the drama and spark of its predecessor. Kate, Blair, and Simon are incredibly uninteresting characters, and the murder victim -- Kate's mother Lily -- is offered almost no character development. It is difficult to care whodunit in this world of incredible, casual wealth, when 24-hour private security can be hired in a snap, there's multiple mentions of china and place settings, and all signs point to the most cliche of murderers. WOW! WOW! WOW! Liv Constantine, (Authors) of “The Last Time I Saw You” have written an intense, captivating, intriguing, chilling, unpredictable, page-turning novel. The Genres for this Novel are Mystery, Thriller, Suspense and Fiction. I couldn’t put this book down, and read it in one sitting. This is another novel, by the same authors, where I was at the edge of my seat, and any sound made me jump. The time-line for this novel is in the present. The authors describe the characters as complex and complicated. So many of the characters seem suspect of the crimes at hand. Dr. Kate English, looks like she has the perfect life. She has a gorgeous young daughter, is a physician, has a family, and is extremely wealthy. Kate’s mother has been brutally murdered. It seems that Kate’s mother was beloved by many, and yet there seems to be suspects who are close to Kate. Soon, Kate starts getting deadly gifts, and strange threatening notes, where it is obvious that someone wants to harm or kill Kate. Kate’s friend Blair starts trying to investigate and come up with answers, that the Police haven’t been able to find. This novel reminds me of “Gaslight”, and Kate is doubting many of the things she is doing. It is like a game of cat and mouse. It is deadly. Who is/are the killers? Why is Kate being threatened? I highly recommend this amazing novel to readers who enjoy chilling thrillers. Yikes. Like many others I enjoyed "The Last Mrs. Parrish" and was anxiously awaiting the next book from the writers, but was left disappointed by this novel. When the novel begins, we are immediately dropped into Kate's mother's funeral, where we learn her mother was murdered, as well as the fact that Kate begins to receive mysterious, bizarre packages, and if that wasn't enough, a reunion between her and her former best friend Blaire. The book alternates between their point-of-views, which even Yikes. Like many others I enjoyed "The Last Mrs. Parrish" and was anxiously awaiting the next book from the writers, but was left disappointed by this novel. When the novel begins, we are immediately dropped into Kate's mother's funeral, where we learn her mother was murdered, as well as the fact that Kate begins to receive mysterious, bizarre packages, and if that wasn't enough, a reunion between her and her former best friend Blaire. The book alternates between their point-of-views, which even early on was confusing. One particular thing that stuck with me was that Blaire mentioned Kate pulling her to talk during the funeral and since I'd just finished reading Kate's point-of-view, I knew the opposite to be true. There were quite a few little errors that drove me crazy and by the middle half of the book, I started skimming. I didn't grow to care for either of these two women or the other characters in the novel. Dr Kate English tries to cope with the unexpected and recent murder of her mother. Shortly after the funeral, Kate begins to get threatening messages. From texts, to an email and even dead animals, Kate begins to unravel. Her estranged childhood best friend Blaire, who she This book blew me away! From the plot twists to the intriguing characters, The Last Time I Saw You by sisters, Lynne and Valerie Constantine, who go under the pen name of Liv Constantine, is everything I was expecting and more. Dr Kate English tries to cope with the unexpected and recent murder of her mother. Shortly after the funeral, Kate begins to get threatening messages. From texts, to an email and even dead animals, Kate begins to unravel. Her estranged childhood best friend Blaire, who she reconnects with at the funeral, steps up to help Kate through her grief. Now a successful mystery novelist, Blaire uses the knowledge she gained from her career to try to solve the murder of Kate’s mother, Lily. I was captivated by this book from the very first page. I couldn’t put this book down. I wanted to get to that moment where the author reveals all, and let me tell you, this certainly wasn’t what I was expecting. The Last Time I Saw You by Liv Constantine was a fast-paced, twisted thriller that left me absolutely shocked by the ending! You will not regret reading this book! This was a very enjoyable and fast read. The characters were very interesting and lots of fun plot twists that I enjoyed. Thanks to NetGalley and the publisher for a free copy in exchange for review. An unexpected murder forces Kate and Blaire to mend old wounds and be there for each other. Kate is also being threatened and as she fears for her safety, she clings to Blaire for support. There are so many suspects here: Kate’s husband, her own dad, an old childhood friend, a scheming employee of her husband, and the list goes on. It did feel like this book was authored by two people because so many things are happening that don’t feel harmonious. I did appreciate that the ending had layers of An unexpected murder forces Kate and Blaire to mend old wounds and be there for each other. Kate is also being threatened and as she fears for her safety, she clings to Blaire for support. There are so many suspects here: Kate’s husband, her own dad, an old childhood friend, a scheming employee of her husband, and the list goes on. It did feel like this book was authored by two people because so many things are happening that don’t feel harmonious. I did appreciate that the ending had layers of twist. I was really misled about who the culprit was. The Last Time I Saw You is a psychological suspense filled with shocking twists. This is my first book by these authors (these are two sisters writing together under the name Liv Constantine). The book takes place in Maryland and has two 3rd person POVs: childhood estranged best friends Kate and Blaire. Kate is a pediatric cardiothoracic surgeon and Blaire is a famous writer. The book starts off with a chilling prologue (someone is stuck in a fire). Then in the present someone is murdered. The stor The Last Time I Saw You is a psychological suspense filled with shocking twists. The book starts off with a chilling prologue (someone is stuck in a fire). Then in the present someone is murdered. The story centers around Kate, her husband Simon, her father Harrison, and her former best friend Blaire. I was fascinated with this book right from the start. I was intrigued with the two narrators and was very curious about the murder. Plus someone is terrorizing one of the narrators. And I was very interested in that part of the story as well. There were a bunch of suspects and lots of clues. And I enjoyed this aspect of the story so much. The last part of the book completely freaked me out because I was not expecting it at all. It was basically one shocking twist after another. It was crazy, but exciting. I read a lot of suspense. But the amount of reveals at the 70% mark and on was astounding. It was amazing, although slightly shocking and over the top. The ending was interesting. Overall I really enjoyed this book. This was a huge disappointment. Especially since the Constantine sisters' debut, "The Last Mrs. Parrish" was awesome. It's partly a psychological suspense that is so painfully obvious you can see what's coming from miles away...and very early in the book. The other part is a murder mystery that is strictly by the numbers. You are left somewhat guessing, but after the letdown of the one part you just don't care anymore. It's too predictable. A lot of the time the story defies logic and sense. To the This was a huge disappointment. Especially since the Constantine sisters' debut, "The Last Mrs. Parrish" was awesome. A lot of the time the story defies logic and sense. To the point of being silly. The ending ain't no big twist, either. It's plain blah. I'm giving it 3 stars because the writing is good and it's fast-paced. 2.5 stars. The first 2/3 of the book was not great - to the point of me wanting to abandon it. It seemed very repetitive with no major plot progression. The last 1/3 of the book was better, but not by much. Nobody does manipulative women like the Constantine Sisters! This is a delicious page-turner that delivers on both the mystery and the drama. 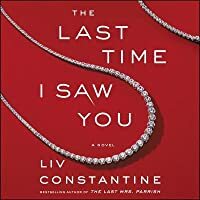 Liv Constantine is the pen name of USA Today, Wall Street Journal, and international bestselling authors and sisters Lynne Constantine and Valerie Constantine, co-authors of the Reese Witherspoon book club pick, THE LAST MRS. PARRISH. Separated by three states, they spend hours plotting via FaceTime and burning up each other’s emails. 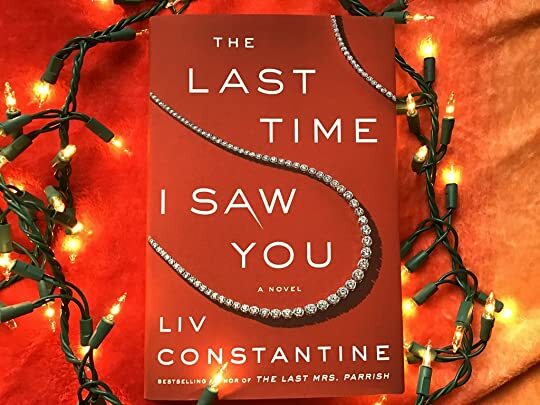 They attribute their ability to concoct dark story lines to the Liv Constantine is the pen name of USA Today, Wall Street Journal, and international bestselling authors and sisters Lynne Constantine and Valerie Constantine, co-authors of the Reese Witherspoon book club pick, THE LAST MRS. PARRISH. Separated by three states, they spend hours plotting via FaceTime and burning up each other’s emails. They attribute their ability to concoct dark story lines to the hours they spent listening to tales handed down by their Greek grandmother. 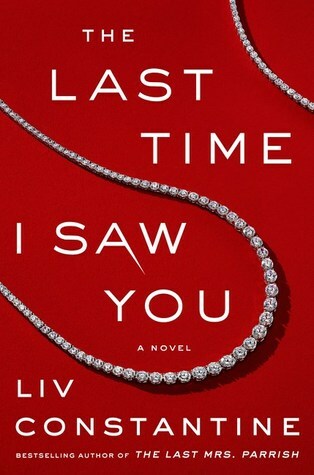 Their next book, THE LAST TIME I SAW YOU, will be released on May 7, 2019.